For One Family, A Chance to Start Again. 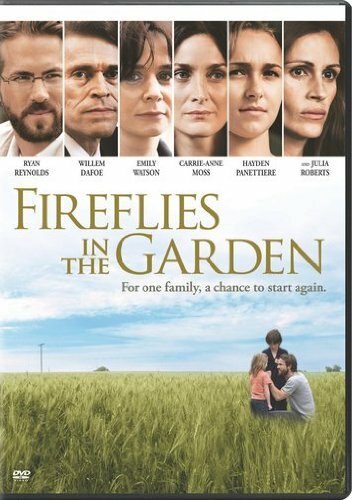 Fireflies in the Garden has a running time of 88 minutes and is rated R for language and some sexual content. CULVER CITY, CALIF. (January 9, 2012) - An all-star cast headlines the powerful, character driven drama Fireflies in the Garden has a running time of 88 minutes and is rated R for language and some sexual content., debuting on DVD and Digital February 7th from Sony Pictures Home Entertainment. Ryan Reynolds (Green Lantern, The Proposal), two-time Best Supporting Actor Oscar(R) nominee Willem Dafoe (Platoon, 1986; Shadow of the Vampire, 2000), two-time Best Actress Oscar(R) nominee Emily Watson (Breaking the Waves, 1996; Hilary and Jackie, 1998), Carrie Anne Moss (The Matrix trilogy), Hayden Panettiere (TV's "Heroes") and Academy Award(R) winner Julia Roberts (Best Actress, Erin Brockovich, 2000) star in the story of a seemingly perfect family and the conflicting, interpersonal relationships which bring their dysfunctional and destructive elements to the forefront. When a tragic accident leaves them without the one person they could count on to keep them together, they are forced onto a path in search of forgiveness and redemption. Bonus materials include the behind-the-scenes featurette "A Flash of Life: The Making of Fireflies in the Garden." Fireflies in the Garden will be available for $30.99 SRP (DVD). Directed and written by Dennis Lee, Fireflies in the Garden was produced by Marco Weber, Vanessa Coifman, Sukee Chew and Philip Rose, with Jere Hausfater and Milton Liu acting as executive producers.